Oh my, am I excited about today. I am a knitter, there’s no question about that, but long before I ever picked up a knitting needle, I was a reader. I was the kid who would rather sit and read than do most other things and would often go through multiple books on holidays and camping trips (something that caused me a lot of anxiety when packing because, what if I ran out of books!?). When it came time to go to university, studying English was a no-brainer, and I remain a voracious reader, and while I’m discerning, I’m not a total snob. I read a lot of new books, but one of my favourite things is to go back and reread books I loved as a kid, and thanks to Audry Nicklin’s new collection Lit Knits, I have added 10 classics to my bedside to-(re)read pile. Chances are, you recognize Audry’s name, either because you read her blog or because you’ve seen her designs pop up on Ravelry (among many other things, she designed those incredible pie-shawl star maps, Celestarium and Southern Skies). Her latest collection is ten designs, each inspired by a classic children’s novel – including Alice’s Adventures in Wonderland, Anne of Green Gables and Wind in the Willows. Clearly, Audry and I had similar childhoods, because with the exception of 20,000 Leagues Under the Sea, I’ve read (or been read) all of her inspirations. Knitwear inspired by literature is growing genre, but Audry’s take on it is different. Rather than creating garments that are mentioned in the novels, or intended for a specific character, she is inspired by the novels, which makes her designs stories in themselves. For example, Sail to Treasure Island is a blanket that is also a map to the treasure. The border is the ocean, followed by the beach, the forest, and the mountains, and in the middle, X marks the spot. This is the kind of design I imagine wrapping around a child right before bedtime stories. Of course, I also imagine it knit in a lighter weight yarn and wearing it as a shawl while curled up in a chair reading. It’s a beautiful and versatile design, full of thoughtful details that would make it both interesting to knit and a pleasure to wear. Motoring Madness, photo by Audry Nicklin, from Ravelry. 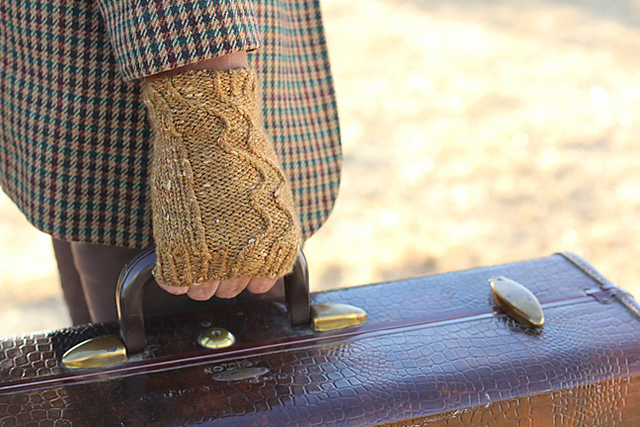 I also love the Motoring Madness fingerless mitts, inspired by Toad’s awful driving in Wind in the Willows. I have been meaning to make myself a pair of fingerless mitts for over a year now (every fall and every spring I wish I had a pair) and these are perfect. Simple enough to be a quick knit, but still stylish and fun. I even have some Acadia yarn in my stash, so it’s clearly meant to be. Lit Knits is a really comprehensive collection, including socks, shawls, a scarf, a cowl, mittens, a blanket, and an incredible hoodie (that most of these designs are unisex just adds to the possibilities). But not only is there breadth in patterns, there is also a range of design elements. Audry uses lace, cables, twisted stitches and stranded colourwork, offering up a little of everything. Even better, she includes detailed technical instructions, which makes Lit Knits a great collection for knitters looking to expand their skills as well as more experienced knitters. It is so good. 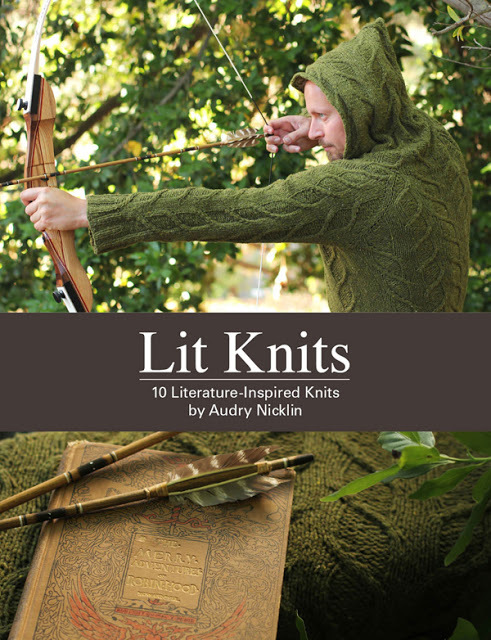 Lit Knits is available in both e-book and print versions, but from now until Sept. 25, if you pre-order the print book you’ll also get a download code for the e-book. I love having both a physical copy of a book to flip through and a digital copy for easy chart printing, so clearly I chose this option. Both versions of the book are available on Audry’s website, and through Ravelry. To read more about the inspiration behind each pattern, head over to Audry’s blog – she’s doing an excellent series of posts with photos from the book (and photos that didn’t make it into the book) and stories about each pattern. So, what would you knit from Lit Knits? I really don’t know! I was looking through all the old posts about the photo shoots, and in the beginning, my favorite was Sail to Treasure Island. Treasure Island has been read to me a fair few times, and now I want to go and read it myself :). But then I saw the Down the Rabbit Hole mittens, with the watch face on one palm, and I think they became my new favorite…But I don’t really wear mittens, and I could always use another blanket wrap thing. But that watch face is rather cute… I haven’t actually read Alice in Wonderland, I keep meaning to but never getting around to it! Such beautiful and creative designs. Breath-taking and definitely inspiring. What I appreciate most is the different perspective Audry chooses when designing. Her “muses” really are fascinating and I can only imagine the time, effort and love she puts into her creations. I think all of the designs are wonderful and if I had the skills and patience I would consider “The Sail to Treasure Island” blanket …. but I’m not quite ready for something of this caliber. Alternately, my choice is “The Deep Sea Wanderer” scarf. It looks brilliant and I think the color used for the pattern and book photo is brilliant. I love the “rivet” detailing and the lace repeat doesn’t detract from the “weight” of the scarf. Altogether perfect combination of elements in design. I definitely have to put this book on my knitter’s wish list. Thanks for sharing this … just wonderful. I’d have to say the Down the Rabbit Hole mittens – I just love the pocket watch design on the left mitten. (And because I need the practice with color work.) I really loved ready about her inspirations from the books she selected, and anything related to Robin Hood instantly catches my eye. I like Deep Sea Wanderer and Sail to Treasure Island the best! I would love to knit sail to treasure island! And I have read every book she used as inspiration at least twice! It is such an excellent collection. I didn’t want to say the same things as everyone else, so I avoided the earlier posts, but I went back and read yours this morning. Such a thoughtful way to kick off the blog tour! And so perfect with the bread crumb imagery. I love the Robin Hoodie. The cables and pointed hood are awesome! I love Deep Sea Wanderer…and have some Dream in Color that would be perfect! My daughter, however, would clean put the dishwasher every day for a month for the Down the Rabbit Hole mittens! Adorable!!!! Hi Kimberly! Congrats – the random number generator picked you! How can I get in touch? The deep sea wanderer is both beautiful in color and the most amazing textured design. I would love to make that pattern for myself, especially after doing a lot of gift knitting this would make me very happy!!! What fabulous patterns; they’re all beautiful! I loved so many of these books as a child, but the Behind the Garden Wall socks are edging it, because I loved that book and I LOVE those socks – I must knit those socks! (And I’m not that keen on sock knitting!). I adore the Robin Hoodie, though I must admit I suspect it looks better on the model than it would on my middle aged slightly rotund husband! The Robin Hoodie is one of my favorites! Oh this is such a clever idea! The Sail to Treasure Island is the one that amazed me the most. What a cleverly inspired project. 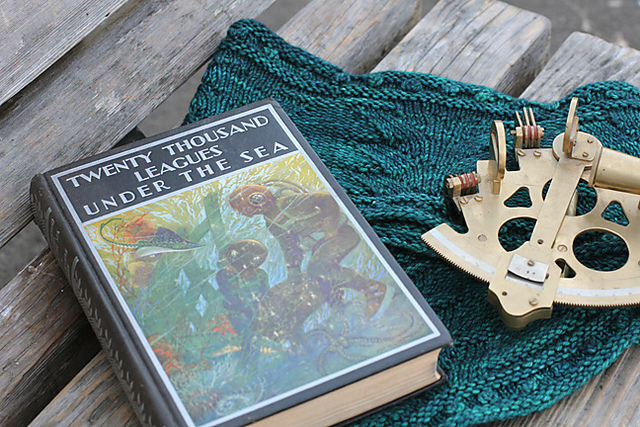 I also want to knit Deep Sea Wanderer RIGHT NOW. Looking on her blog, the photography for this book is just amazing. I’m incredibly impressed by this!! I’m completely smitten with the Robin Hoodie! Thanks for hostessing. I was a reader first too and one of my fave books is Alice in Wonderland so it would definitely be “down the rabbit hole” mittens for me if I should be so lucky as to win the book! Sail to treasure island is jaw dropping! What a nice giveaway. I love love love the robin Hoodie, but I have to say the leafy socks are my fave, I can’t resist anything woodsy regaled at all, I think they’d be gorgeous in and arranged yellow graduated yarn for the CC! I don’t know how I’ve missed those wonderful patterns but I’m so glad I’ve found them now. I’ve read most of the books – maybe not all of 20,000 Leagues – but the absolute must-knit for me would be the Motoring Mitts. I used to read The Wind in The Willows to my son when he was a tiny baby. At that time, we lived in a fairly chilly place and I reckon those mitts would have been just the shot to keep my hands warm at midnight. Toad is so silly and the mitts such a marvel that there’s not much competition (apart from the Black Beauty socks and the Avonlea shawl and – but the mitts would definitely have priority. Definitely). I really like the Robin Hoodie, but I think my fave has to be the Behind the Garden Wall Socks, as I can’t resist anything leafy, I think they would be gorgeous with a orange/yellow variegated yarn CC to make them autumnal leaves. Avonlea and Black Beauty Rides On are my favorites. 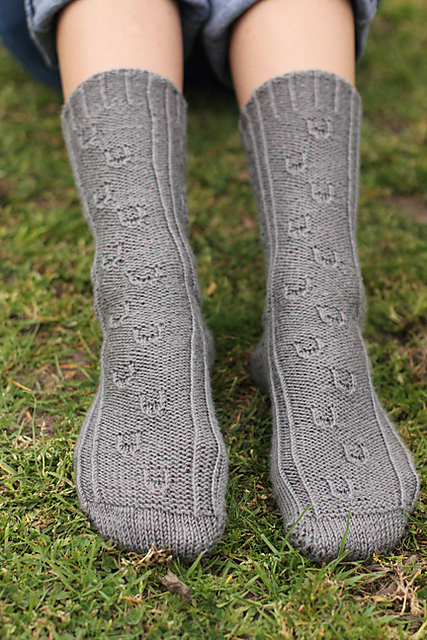 Today I think my favorite is the Secret Garden socks, as I’m getting back into knitting socks. Though, who knows what it will be tomorrow. It would be hard to choose just one knit from this book. As a kid I loved to read the secret garden and as an adult I have a secret garden of my own. My garden has several areas where you enter through green doorways and arches. My favorite entrance is a found wood structure that acres up and has two benches inside for relaxing and knitting. Right no I have curly willow growing by it and the willow is taking over the structure forming a green roof and sides. When I sit inside a person can walk right by and not see me as long as I am quiet. 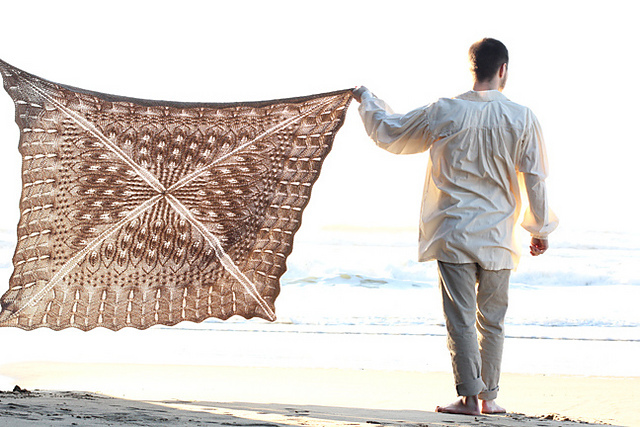 Perhaps the first knit for me would be the secret garden shawl. Avonlea. Anne is still my kindred friend. Thank you for hosting!